For other uses, see Arrowwood (disambiguation). Last of four elevators along the former CPR track bed on the west side of town. 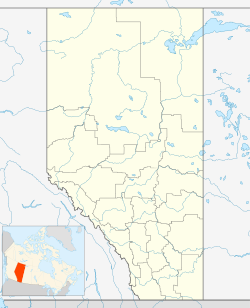 Arrowwood is a village in Vulcan County, Alberta, Canada. It is located on Highway 547, approximately 60 kilometres (37 mi) east of Okotoks. The community takes its name from nearby East Arrowwood Creek. In the 2016 Census of Population conducted by Statistics Canada, the Village of Arrowwood recorded a population of 207 living in 72 of its 79 total private dwellings, a 10.1% change from its 2011 population of 188. With a land area of 0.75 km2 (0.29 sq mi), it had a population density of 276.000276.0/km2 (714.837714.8/sq mi) in 2016. In the 2011 Census, the Village of Arrowwood had a population of 188 living in 70 of its 74 total dwellings, a -14.9% change from its 2006 population of 221. With a land area of 0.66 km2 (0.25 sq mi), it had a population density of 284.848284.8/km2 (737.754737.8/sq mi) in 2011. The population of the Village of Arrowwood according to its 2011 municipal census is 188, a 16.1% decrease from its 2007 municipal census population of 224. The village is governed by a village council consisting of a mayor and two councillors, and is administrated by a village administrator. Municipal elections are held every four years. The Canadian-American actress Joyce Meadows was born in Arrowwood but left the village in her early childhood. ^ "Location and History Profile: Village of Arrowwood" (PDF). Alberta Municipal Affairs. October 14, 2016. p. 43. Retrieved October 17, 2016. ^ Place-names of Alberta. Ottawa: Geographic Board of Canada. 1928. p. 13. ^ "2010 Official Population List" (PDF). Alberta Municipal Affairs. September 15, 2010. Retrieved December 12, 2011. Arrowwood Story (Mistsa-Katpiskoo): In the Shadow of the Buffalo Hills. 1964. This page was last edited on 4 July 2018, at 13:41 (UTC).